Here is a fantastic summer meal idea when it’s too hot to turn on the oven and you’re tired of eating salad for dinner. That was us last week! 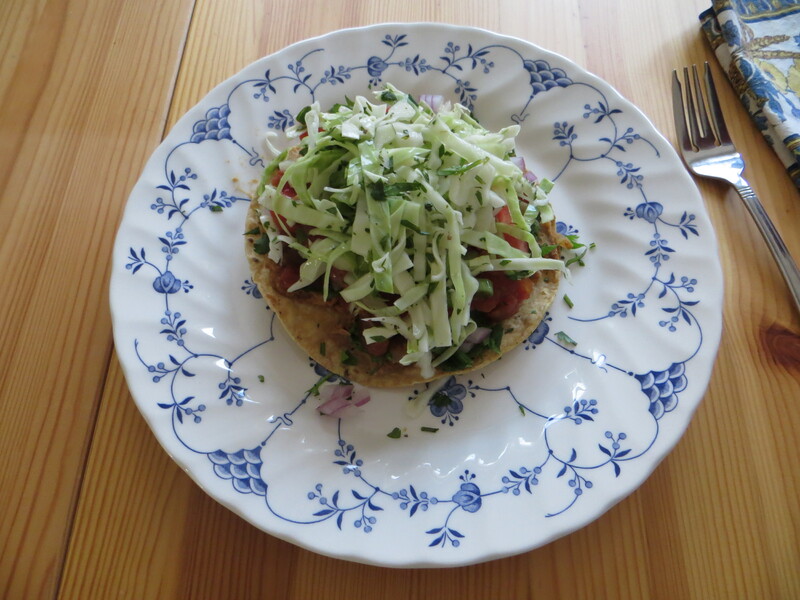 So we decided to make some tostadas with an improvised cabbage slaw and a doctored-up can of pinto beans. Everything turned out really tasty, so I figured I’d share the idea here. These aren’t really strict recipes, just ideas for inspiration in your own kitchen during these dog days of summer. Tostadas are fun – make some tonight! These aren’t hard-and-fast recipes here, just quick and easy ideas to get you started! Adjust ingredients, amounts, and seasonings to your liking. Make the slaw first and let it marinate in the fridge while you get the rest of the meal prepared. Heat a small amount of olive oil in the bottom of a saucepan or deep skillet. Add onions and garlic and cook until fragrant. Add drained and rinsed pinto beans and whatever spices you are using. Stir everything around and let cook for a few minutes. Add lime juice. Smash up the beans a bit (I use a potato masher) to desired texture. Turn off heat and stir in cilantro, more lime juice (if you want), and adjust seasonings (sometime I add a little salt, depending on how salty the beans were to begin with). Place the cabbage in a bowl and add a good pinch of salt. Toss to combine. Then, add the rest of the ingredients and stir it all up. Let the slaw sit for about 30 minutes so the flavors combine and the cabbage softens a bit. Add as much lime juice as you want/need – we like ours very lime-y! On each tostada shell, spread some of the pinto bean mixture. Top with whatever toppings you’d like: chopped tomatoes, avocado slices, shredded cheese, grilled veggies, chopped onion, etc. Add your favorite salsa or hot sauce then pile on the cabbage slaw! I always add a little extra fresh chopped cilantro to mine. Enjoy! Categories: beans, cabbage, easy, limes, Mexican, summer meal, vegetarian | Tags: cabbage, easy, Mexican, vegetarian | Permalink. 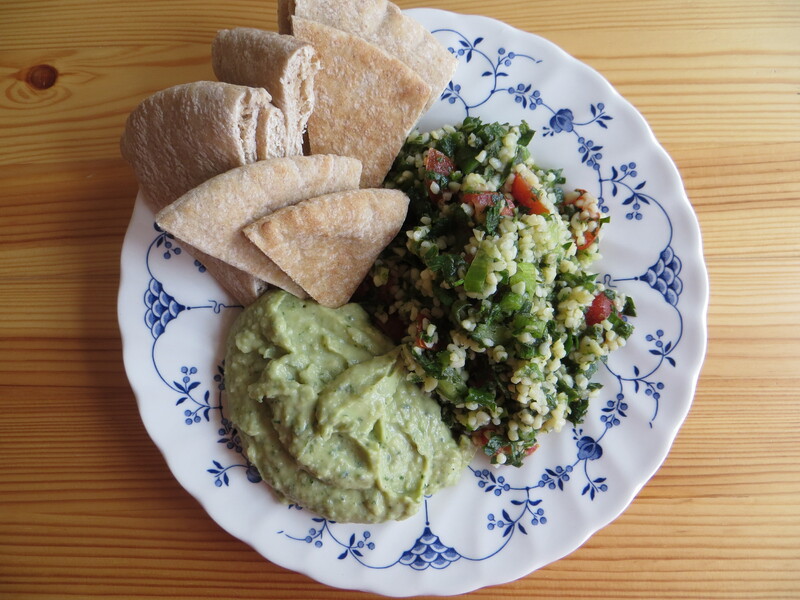 Is it Tabbouleh or Tabouli? I’ve seen both spellings. Either way, it’s a pretty tasty salad that’s super easy to make! I always like to pick up a container of Tabouli at the Middle Eastern bakery in our neighborhood where we buy our favorite dill hummus and spinach pies. 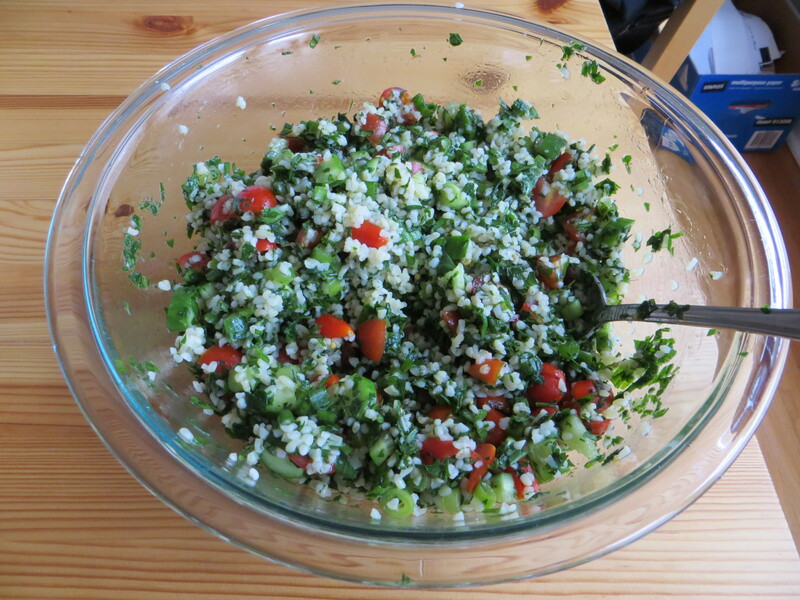 I also sometimes buy Cedar’s brand Tabouli at the grocery store, which is surprisingly very good. A few weeks ago, I was scrounging around the pantry looking for things to use up. I had forgotten about this bag of bulgur that I bought to make our new favorite veggie chili recipe. Anyway, the back of the bag had a recipe for Tabouli so I figured I’d try it! It was a delicious experiment. Fair warning: there is a not-insignificant amount of veggie and herb chopping involved in making this salad. But the end result is worth your effort, promise! And buy more parsley than you think you’ll need. I ended up using the entire bunch to just barely get the 1 cup needed. Also, and this is for a certain Soup and Such reader who tends to go rogue on recipes, don’t skimp on the chopped fresh mint! It adds such a nice flavor to the salad. Obviously hummus is a perfect companion here, but I ended up making this favorite white bean dip to eat with the Tabouli. A super refreshing and light summer lunch! If you try this recipe, let me know how it turns out! 1. Rinse bulgur in a strainer or sieve a few times, until the water runs clear. Place rinsed bulgur in a bowl and cover with boiling water. Let sit for 30 minutes. 2. Chop all the veggies and herbs and combine with the lemon juice, olive oil, and salt + pepper in a bowl. 3. Drain the bulgur. You want to try and get as much water out of the bulgur as possible. What I did was use my (clean!) hands and squeezed handfuls of the bulgur to get any remaining water out. Then, add the bulgur to the rest of the ingredients and toss to combine. Let the salad sit in the fridge for about an hour before you eat it. You want to give it some time so the flavors can mingle and marry. Enjoy!